New Doctor Who companion Freema Agyeman says she has been overwhelmed by the positive response she's received from fans of the long-running sci-fi series. Her character Martha Jones, a trainee doctor, will be seen stepping into the Tardis when Doctor Who returns to BBC One at the end of the month. Speaking after being mobbed by autograph hunters and photographers at the series launch in London, Agyeman said: "I'm so bowled over at how encouraging the fans have been from day one." The BBC has confirmed that Doctor Who, which stars David Tennant as the Time Lord, will be returning for a fourth series next year. 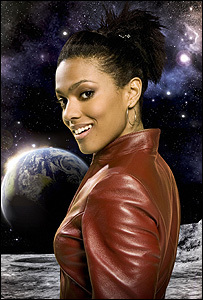 Russell T Davies, the show's executive producer, said he couldn't wait for viewers to meet Martha Jones, who joins the Doctor following the departure of his previous assistant Rose Tyler, played by Billie Piper. "I just think people will open their hearts and let her in - they'll love it." Asked about the chemistry between Martha and the Doctor, Davies said: "She's working flat out as a medical student, then in walks the most amazing man who saves the world in front of her, so you can't blame her if her heart goes pitter patter..."
The opening episode - Smith and Jones - sees the Doctor meet Martha in a London hospital, which is dramatically transported to the Moon. There they battle a blood-sucking alien and the Judoon - a clan of galactic stormtroopers. As you would expect from a Russell T Davies-penned episode, it's full of witty one-liners, some nasty bits to scare the younger viewers and breathtaking special effects. Agyeman first appeared in a Doctor Who episode last year as a minor character, who is later revealed to be a cousin of Martha. But now she's back as a bona fide passenger in the Tardis, has she had any advice from any former Doctor Who companions? "I got messages from Billie and Elisabeth Sladen (Sarah Jane Smith). I'm companion number 32 or 33 so it's nice to hear former companions say 'just do it your way' - it means the world to me," she told the BBC News website. And she thanked fans for making her feel so welcome. "I'm so grateful. Not a lot of people like change, but the fact they are embracing it is great for me." Agyeman acknowledged there are a few similarities between Martha and Rose. "They are both fiery and feisty, but you need those qualities to be a Doctor Who assistant. You can't be a shrinking violet and go to the Moon. "But Martha is more independent, more academic. She can see that the Doctor is a man with a broken heart." 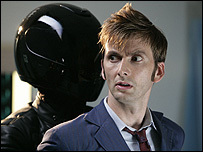 Actor David Tennant hinted at interesting developments in their relationship. "The Doctor thinks he's moved on and that he's terribly strong, but Martha realises that he needs her more than he realises. That story will twist and turn over 13 episodes - so stay tuned," he said. Doctor Who, which is made by BBC Wales, will feature a host of guest actors over the coming weeks, including Sir Derek Jacobi, comedian Ardal O'Hanlon, Michelle Collins and John Simm. John Barrowman will be returning in the role of Captain Jack Harkness - seen most recently in spin-off series Torchwood. And there will be plenty of new monsters, including the witch-like Carrionites and the return of the Daleks. Tennant did let slip that a monster from the 1960s Patrick Troughton era of Doctor Who would also be making a comeback. But Russell T Davies wasn't giving anything way. "It's not the yeti - that's all I'm telling you!" he said.